The nut should hold the strings with even spacing between them and with the appropriate relationship to the edges of the fingerboard. What's appropriate will vary with the type of instrument and the requirements of the player. I find that most new instruments are pretty well set up in this regard. Nuts are made from a variety of materials. Bone was the most commonly used material in the old days, with elephant ivory and mother-of-pearl reserved for finer instruments and ebony for lesser ones. Ebony wears rather quickly, and elephant ivory is out of the question these days for use on production instruments. 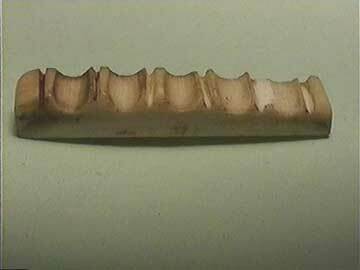 Now it's considered more politically correct to use ancient "fossil" ivory for nuts on fine traditional instruments. Today the vast majority of new instruments are built with nuts made of synthetic materials. There's a great variety of plastics used, some of which are extremely serviceable, others of which are just plain cheap, being too brittle or soft. Corian and Micarta, both trade-name countertop materials, make fine nuts, although they wear faster than the old-time bone (it's cow bone.) Some of the modern graphite-impregnated plastics make fine nuts as well. The different nut materials, from ebony to bone to plastic to mother-of-pear to graphite to ivory and brass, all have an influence on tone. In my opinion, the nut material can only be "heard" in the tone of the open strings. Once a string is fretted it is no longer influenced by the nut. I'm not going to discuss the pros and cons of nut vis-à-vis tone, because that's a matter of subjective opinion. Suffice it to say that softer materials such as ebony tend to dampen, and hard materials (bone, pearl) tend to emphasize the highs. I'm not all that concerned with the actual material of the nut. I'm more interested in the design and function. Cheap materials generally make a nut that works OK but tends to crack under the string pressure or tends to wear out quickly. In short, give me old-fashioned cow bone. It polishes to a high luster, wears extraordinarily well, and doesn't cost much. For the purposes of this article, I'll presume to be discussing nuts made of bone. My observations will still apply to other materials; the appearance and wear characteristics will vary. Since I'm making nuts one at a time for repair, the cost of material is insignificant, so I'll choose bone most of the time. Well, OK, cost of ivory or pearl aren't exactly insignificant. Nicely fitted, finished, rounded, with the strings sitting each in its fitted notch with good support, even spacing, correct height. It's polished and looks great. Wow! Looks bad. Strings are buried deep in notches many times to wide for them. No fine polish here, this thing looks pretty crude. HOWEVER, I don't see any problem with the function. It's holding the strings at exactly the right height, and a correct spacing. Each string bears cleanly at the bottom of its slot, draws smoothly when tuned and notes cleanly. Looks good, doesn't it. The strings are held at the right height, spaced evenly. The nut is finely polished and is fitted perfectly to the neck. So what's wrong with this picture? I gave you a clue with the "good" nut above. It's the bearing surface. It's barely 1/16" broad where the string sits. Notice how the string bears across the nut. It's pressing downward on a very narrow point. As the bass strings are tuned, they'll act like little files and grind very quickly into the nut. Soon, they'll be sitting lower in relation to the fingerboard. In short, a couple of months from now the action will be too low at the nut.